In a large mixing bowl, beat the egg; set aside. Warm the milk according to the yeast manufacturer’s recommendations on the packaging. Add warmed milk to the egg. Add melted butter, yeast, sugar, optional salt, and stir to combine. Add 2 cups bread flour and using a spoon and then your hands, form the dough. Turn dough out onto a floured work-surface. Knead for 5 to 8 minutes, or until smooth and supple. If necessary, add up to one-third cup additional flour, for 2 and 1/3 cups total (12 ounces total by weight), in order for the dough to combine and become smooth. The more flour that’s added, the denser and heavier the bread will be; so add it only as necessary. Mound the dough into a ball. Spray mixing bowl (the same one used to make the dough is fine) with cooking spray or lightly grease it, and place dough into bowl.Cover bowl with plastic wrap and place in a warm, draft-free place until doubled in size, about two to three hours. Punch dough down, remove it from bowl, and place on floured work surface. 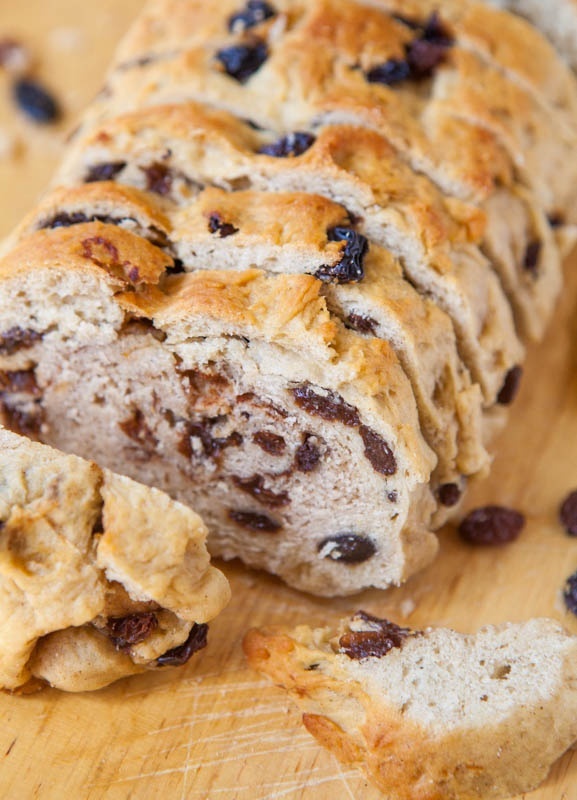 Sprinkle raisins over the dough and knead them in, for about 2 to 3 minutes. Flatten the dough into a large rectangle, about 8-inches-by-12-inches. Pinch off ends and place dough log into a sprayed or greased 9-by-5-inch loaf pan, seam side down. Cover pan with plastic wrap and place in a warm, draft-free place until almost doubled in size, about two hours. In the final minutes of the second rise, preheat oven to 375F. Bake for 25 to 35 minutes, or until golden on top. When bread is removed from loaf pan and tapped sharply on the top and bottom, it should sound hollow. Place bread on a wire rack to finish cooling completely before slicing and serving. Bread keeps for up to 5 days, but can also be frozen. *** To make homemade buttermilk, place 1 tablespoon of vinegar or lemon juice in a liquid measuring cup. Fill cup with milk until it reaches the 1-cup line. Let stand for five minutes. A yummy classic European breakfast. Make croutons: Preheat oven to 400°F. Place bread cubes in shallow, wide bowl. Whisk together butter and Dijon, then pour over bread fingers. Sprinkle with salt, pepper, both types of cheese, parsley and thyme, if using. Toss to coat. Spray rimmed baking sheet with nonstick spray. Scatter bread on sheet. Bake croutons until crisp and golden, turning, about 20 minutes. Set aside. Meanwhile, cook eggs: Bring a medium pot of water to a steady boil. Add eggs and cook them for exactly six minutes, maintaining the heat at a simmer, then drain and rinse them briefly in cold water. Holding the egg vertically, pointier side down, with a towel or paper towel to protect you from its heat, tap a knife around the “neck,” about half an inch below the top so that you can remove a little “lid” area. Place the egg in a small dish, opened side up, and serve with a small spoon and toast soldiers. Don’t have adorable chicken or other tiny egg cups and spoons? With a little patience, you can peel the soft-boiled eggs as you would a hard-boiled one. It’s tricky, because they are liquid in the center, but doable. For this method, arrange four of your croutons on a small plate. Place the peeled egg over the croutons and smash it lightly, delightfully (if you don’t find this to be really fun, I am not sure we can be friends) with a fork. Season with salt and pepper and eat with a fork and knife. 1. Beat the cream cheese together with the eggs in a bowl until the mixture is almost smooth. 2. Stir in the flour, sugar, and 1 teaspoon of melted butter to make a batter. 3. Heat remaining 1 teaspoon of butter on a griddle or in a heavy frying pan over medium heat. 4. Drop the batter onto the griddle in silver dollar-sized dollops; cook until lightly golden brown, about 3 minutes. Turn the pancakes over and cook an additional 2 minutes. 5. To serve, sprinkle with confectioners’ sugar and drizzle with lemon juice. Serve with lemon wedges.